The sinuses are air filled cavities located in the face and around the nose. The sinuses are named according to the bone in which they are located. There are four paired sinus cavities. The maxillary sinuses are located in each cheekbone. The ethmoid sinuses are located between the eyes. The frontal sinuses are in the forehead above the eyes. 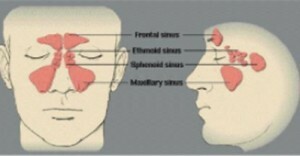 The sphenoid sinuses are in the back of the head, located behind the ethmoid. They drain into the nose via specific openings called ostia. Sinuses serve many functions. They filter, warm and humidify the air we breathe. They lighten the weight of the head. They also protect our vitals structures – the brain and eye, functioning as crumple zones in case of any injury. There are different diseases and pathological conditions affecting the sinuses. Chronic sinusitis is a common condition in which these cavities around nasal passages (sinuses) become inflamed and swollen for at least 12 weeks, despite treatment. Chronic sinusitis can be caused by any infection – bacterial or fungal, inhaled allergens, growths in the sinuses (nasal polyps) or by a deviated septum. Signs and symptoms may include nasal obstruction or congestion that causes difficulty breathing through your nose, and pain and swelling around your eyes, cheeks, nose or forehead. There can be discharge from the nose, sneezing, sensitivity of the nose, headache, heaviness of the head, mild fever on and off, throat irritation and chronic coughs. The nose and sinuses are covered with a complex lining that has millions of cilia ( finger like projections). The lining secretes mucus, which functions to keep the nose moist and has properties to capture and eliminate allergens and certain viruses/bacteria. The cilia sweep mucus in a choreographed fashion to eliminate irritants in the nose and sinuses. When the cilia are damaged, patients develop chronic sinusitis. Viruses, tobacco, allergens, bacteria and certain chemicals damage cilia. Ciliary damage is a difficult and complicated problem to manage. The common pathology to initiate the process is blockage of the sinus opening and collection of secretions in the sinuses. To keep the nose and sinuses healthy there are certain simple measures which can be done as a cleansing routine at home. This helps aeration of the sinuses, prevents collection of secretions, clogging of the sinus openings and also maintains healthy functioning cilia. Washing the nose and sinuses is important step to wash away the deposited dust, bacteria and allergens and collected secretions. Neti-Pots and container with a nozzle or a syringe without the needle can be easily used for nasal washes. You can buy saline nose drops at a pharmacy, or you can make your own saline solution. Add 1 cup (240 mL) distilled water to a clean container. If you use tap water, boil it first to sterilize it and then let it cool until it is lukewarm. Add 0.5 tsp (2.5 g) salt to the water and 0.5 tsp (2.5 g) baking soda. When the water is passed through one nostril, it flows into the nose and the sinuses and cleanses it. It flows out through the other nostril and into the mouth, which can be spit out. Doing this wash daily helps in preventing infections. Sit upright in a comfortable chair and relax. Focus specifically on the relaxation of your belly and chest muscles. Close your eyes and tilt your head slightly upward. Gently, shallowly and slowly breathe through your nose while keeping your mouth closed. Exhale slowly until you feel your lungs have been emptied of air. Hold your breath as long as possible and then repeat from the beginning. As cleansing the skin prevents skin disease, so is cleansing the nose and sinuses ; it prevents from many sinus diseases caused by retention of secretions, bacterial growth especially in people with diabetes and chronic kidney problems and also reduces allergic symptoms. 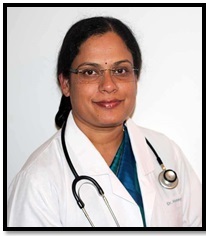 There are definite indications for allopathic treatment and surgery for sinusitis; in cases of deviated septum blocking the sinuses, nasal polyps, tumors in the sinuses, bony narrowing of the sinus outlets, etc. Cleansing routine can be continued with along with the medications also. It helps in speedy recovery. Some simple routines can help you.